Immerse shoppers in your brand and bring energy back into your stores. Video walls add dynamic flair that can immediately change the tone and atmosphere of your stores. Configurable in any shape or size, video walls give you a digital canvas to craft messages and moods that resonate with your shoppers. Whether you want to create a high impact environment or a calm, relaxed setting, video walls can transport shoppers wherever you want to take them. Large in size and bold in content, dynamic video walls are hard to miss. They captivate and connect with shoppers. They offer a clear line of sight that draws attention and can increase foot traffic. Backed by 24×7 monitoring, you can be assured that you’re making an impact around the clock. Interactive technology is all around us, creating memorable brand connections. Interactive kiosks give shoppers the engaging experience they’re looking for. With helpful information, shoppers are armed with the knowledge to make make better decisions and allow them to control their own experience. Interactive kiosks help to blur the lines between online and in-store. They have the ability to bring your website to life and give shoppers more valuable information at the point of purchase. Shopper reviews, color options or available upgrades can help shoppers feel more comfortable, leading to higher conversion and stronger brand connections. Stores have to compete with online sales more and more. Your brick and mortar store has to raise the bar to be successful. With this new product by Convergent, you can close the gap of online and in-store to give your customers a deeper shopping experience. This interactive digital signage tool will create a buzz in your store and feature additional product options for your customer. All these features can be available with the lift-to-discover technology. When store traffic declines, you need to take advantage of every opportunity to attract and keep shoppers. Promotional digital signs receive 400% more views than static signage, making your promotional content stand out among the rest. Since dynamic screens attract more attention than traditional signage, they are an ideal for product promotion. Placed right at the point of purchase, digital signage has been proven to increase product sales in a way that static signage can’t. Promotional boards also help to make in-store marketing more efficient too. Automatic up and down times, targeted delivery (down to a store level) and a speedy deployment make digital signage a more efficient medium than traditional print. It’s no secret that retailers are using digital signage to increase engagement in their stores. Retailers are able to make their purchase simple and efficient with this text to purchase an application from Convergent. Interested in seeing how this can impact your store? Book a demo with one of our experts, the options are endless! Retail is competitive, so give your store associates the tools they need to drive sales. Shoppers are armed with more information and in many cases, know more than your store associates. Sales assist touchscreens help your associates explain products and services and engage customers. They’re a competitive advantage that elevates your brand by providing in-store expertise that keeps customers coming back. Helping store associates communicate complex products and compare alternatives, sales assist displays help to make the buying process easier. It’s a great way to bridge the gap between online and in-store, while giving them the tools they need to succeed. The result: a more streamlined experience for shoppers that increases conversion rates and builds brand loyalty. Omnichannel is real. Only a fraction of product purchases actually begin and end in store and shoppers who can’t find what they want will go elsewhere to buy. Integrated with your e-commerce site, endless aisle expands your store beyond four walls. It allows consumers to shop on their terms while giving them the convenience and selection of online. Offer more SKUs and extend the right product to a shopper while you have them engaged. Endless aisle also provides product comparisons and shows how a particular item will meet their needs, making it easier to buy and improve your brand’s conversion rates. In the end, shoppers get what they’re looking for — and you make the sale. Mannequins don’t move, but digital window displays do. For stores in high foot-trafficked areas, large window-front displays featuring well-choreographed content can drive higher in-store foot-traffic. Digital displays make it easier for marketers and merchandisers to transition to a new look. Leverage window displays to coordinate with other marketing efforts to maximize value. New campaign or product highlight? No worries. Change out window display promotions in a matter of minutes and skip the overnight installations. When the lights inside your store go out, your storefront can still be open for business. 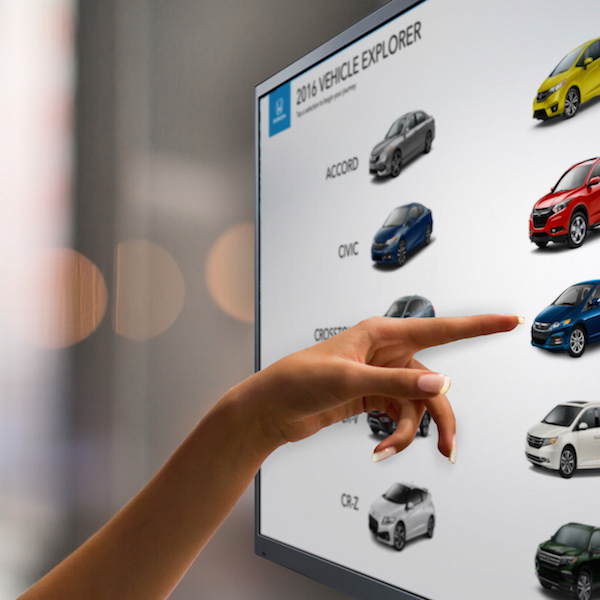 Turn your window display into an interactive touchscreen that enable shoppers to search and view merchandise from your storefront. Give them the power to browse products and then finish the transaction on their smart phones. Your employees are the face of your brand. But how do you ensure compliance and communicate key messages to store associates who don’t regularly access company computers or email? We take the guesswork out of delivering employee communications with back-of-the-house digital signage. Keep employees alert of the latest promotions and give corporate executives a new way to actively communicate to employees on the front line. It’s all about closing the gaps. Integrated into your POS system, displays can show real-time sales data like store conversion rate, average transaction size or sales for the day. It’s a surefire way to distribute sales information to keep everyone on target and drive competition across stores.